Many a trip is organised over a few pints down the local pub especially with like minded birders. It seems as the beer flows dreams about seeing certain birds in outlandish places start to be put into their planning stages but all too often they are left at the bar and are never realised. 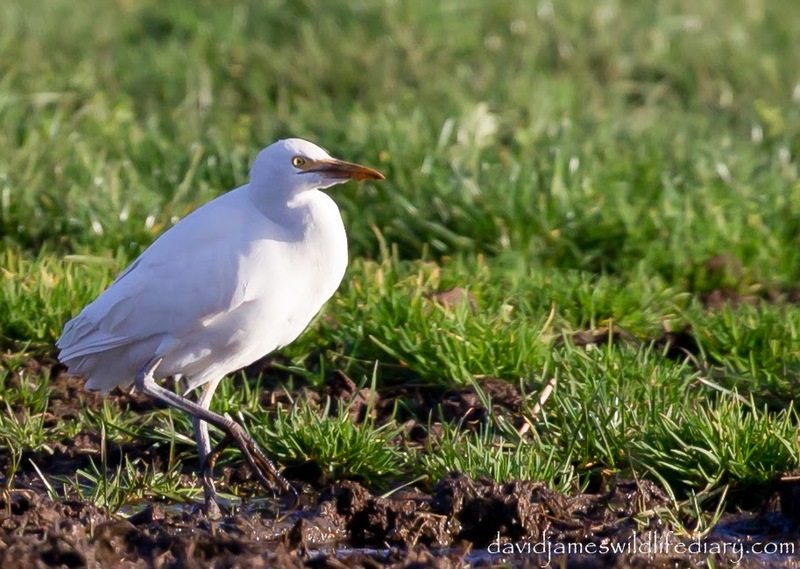 It had been planned during the previous week to see the Ivory Gull in Yorkshire but as it had done a bunk just before the weekend arrived it scuppered the plans slightly but the date was left open for a day out regardless. John Friendship-Taylor met me at the pub on the evening before and we started to talk about what we could do the following day, and the conversation rather quickly turned to talk of the recently discovered Brünnich's Guillemot down in Portland Harbour in Dorset. I did have an alternative motive as there was also a White Billed Diver further along the coast in Devon and I knew if I saw 2 new birds today I would finally reach my 300th bird for Britain (BOU). By the second pint it had been agreed, despite the long distance, and plans started to come together. The other half of our wildlife watching group regrettably couldn't make it due to work commitments and so as we had a couple of seats in the car I rang a few guys to offer lifts which were quickly filled by local birders Martyn Hopper and Andrew Dove. At 5am the following day we set off and headed for Brixham Harbour. Despite the fact that the birds had been showing well the day before the word "mobile" had also been used at the end of the evening and a degree of pessimism, as always, set in during the 4 hour drive. With the help of IPhones and the Sat Nav we managed to find the harbour and my heart had been lifted by an alert from Birdguides to say the Diver was still there as we reached the town. We parked up at the end of the harbour by the replica of Francis Drake's Golden Hind ship and almost straight away a bird came up out of the water and looked around. I couldn't believe it! We had the White Billed Diver right infront of us almost immediately from getting out of the car. It showed incredibly well during our time there and at some points we were almost looking down on it from the harbour wall. 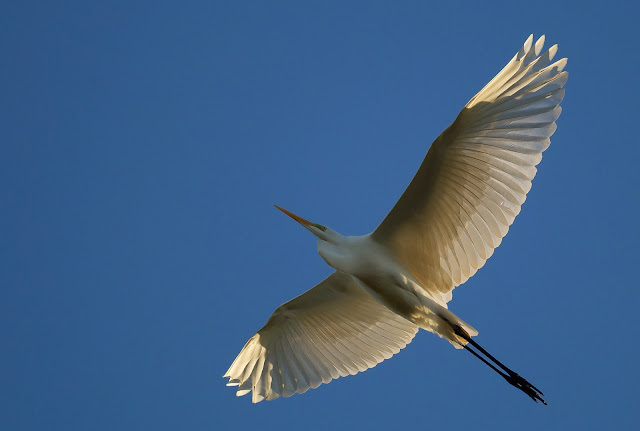 The bill on the bird was amazing and almost looked like a sword. 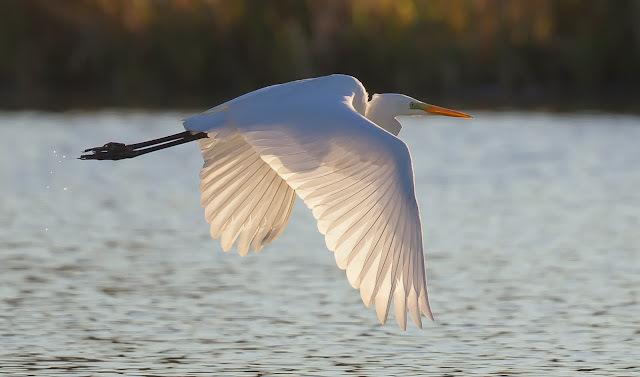 A very impressive bird! Here's a pic and a ropey digiscoped video. Realising the days time restraints we had to leave the Diver and head to our next site. One of the party hadn't seen Cirl Buntings before and as we were just around the corner from a very reliable site we decided to head there next. We arrived at Labrador Bay RSPB after half an hours driving and were rewarded almost immediately with views of a number of Cirl Buntings in the normal hedge by the car park. Martyn Hopper managed a count of 11 with some cracking looking male birds in amongst them. 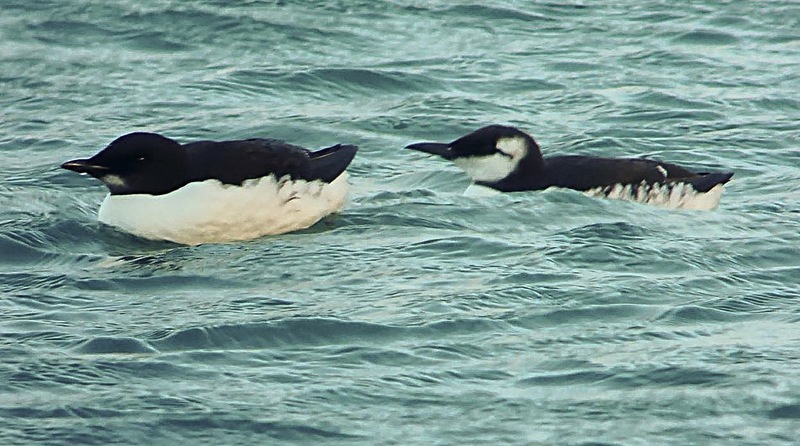 Once again we dived into the car to head to the main target bird of the day, the Brünnich's Guillemot at Portland Harbour. 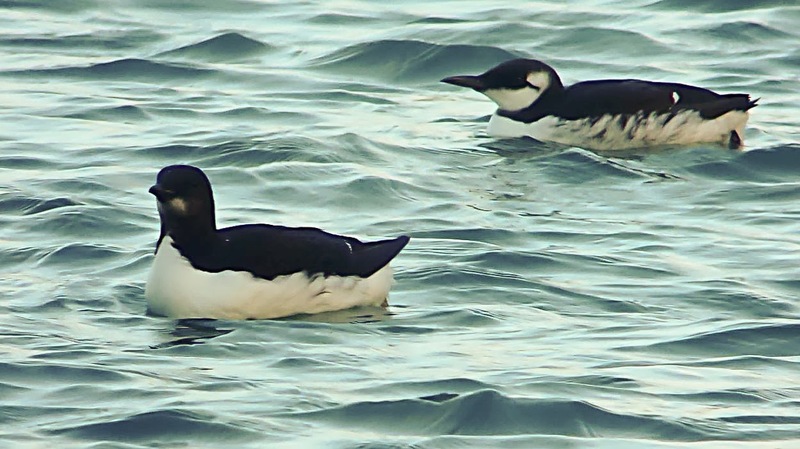 Brünnich's Guillemot is a very hard bird to see for us in the UK, and I think I'm right in saying this is the first twitchable bird on the UK mainland. I have heard of people heading all the way up to Shetland in the past only to dip the bird so knowing the lengths that people have gone to see it we just had to try for ourselves. We had a 2 hour drive from the Cirl Buntings to Portland but we had good news from a few Norfolk birders following a call from Kieran Nixon to say the bird was showing well in the harbour and the regular updates on Birdguides was looking like a dip was hopefully going to be unlikely. After a frantic search to work out what car park we had to be in we finally arrived at the site to be greeted with the news that the Brünnich's Guillemot had just swam in amongst the boats. The other birders didn't seem too concerned though as they said it would soon come out, and sure enough after about 20 minutes it did just that. I can't quite believe just how showy this bird was as it slowly cruised a long the birder strewn shoreline looking up at all the people admiring it before diving and resurfacing in a completely different area. It really put on a show during the hour or so we were there and it was a real treat to see. Despite this though the combination of heavy showers and tons of birders running along the bank meant I never really achieved a decent picture of the bird. 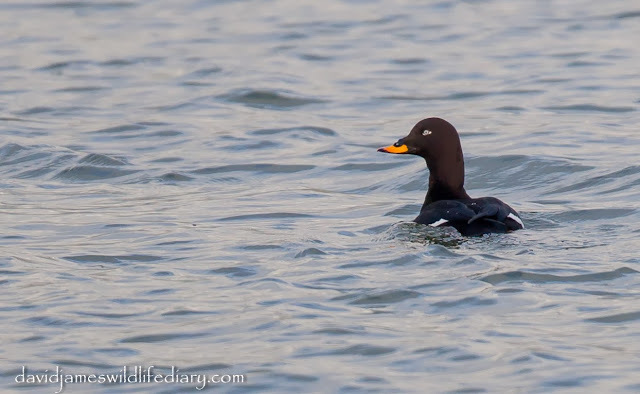 Fortunately Northants County Bird Recorder Mike Alibone attended on the previous day and has very kindly allowed me to share some of his pics on this blog. 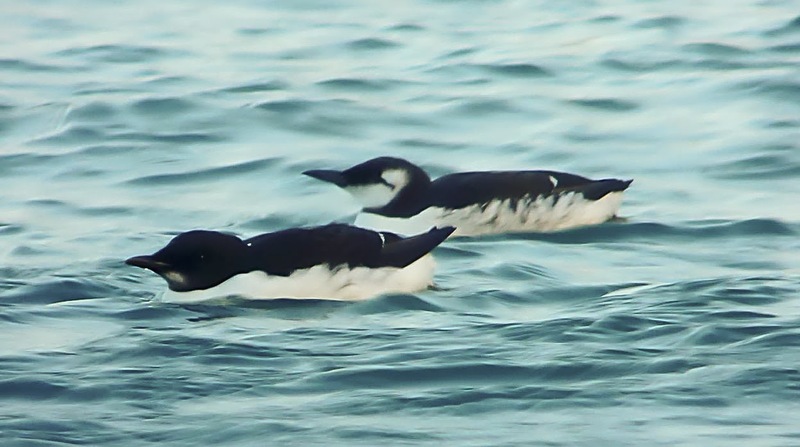 These photos offer a superb comparison with the Common Guillemot to the right and you can clearly see the shorter bill, lack of white behind the eye, thin white gape stripe and white on the underside of the throat all telling it to be a Brünnich's. The white flanks also look a lot cleaner than the Common Guillemot which is also an identifying factor. Whilst waiting in between the Brünnich's Guillemot's regular sorties out into the open a brief scan across the area showed it to be full of birds with a Razorbill, Black Guillemot, Common Guillemot, Common Eider and numerous Shags and Red Breasted Mergansers along with a few Great Northern Divers and a couple of Black Throated Diver thrown in too. We reluctantly left the site to head into Weymouth itself to see another local bird that was causing a bit of a stir and sure enough when we found the flooded playing field right in the middle could be seen a Glossy Ibis calmly wandering around despite the kids shouting nearby and the nearby busy road. It looked stunning despite the now cloudy conditions and was a fitting end to a great day. We were lucky enough to see some real rarities today, and the fact that they all showed so well was just incredible. I think the bird of the day though, despite the Brünnich's Guillemots rarity has to go to the White Billed Diver - that bill was just astonishing! I genuinely cannot think of a better way of spending a day during the last weekend of a superb year of wildlife watching. It is a fitting end, and I finally did it! I hit 300 birds for Britain!! The day I went to see the Hume's Leaf Warbler (see previous post) I heard that quite a few people were heading up to see the Velvet Scoter at nearby Eyebrook Reservoir afterwards but the combination of having seen a Velvet Scoter at Grafham Water the previous weekend and the sheer sense of relief at seeing the Hume's Warbler meant that we went for a celebration pint instead in the pub instead. 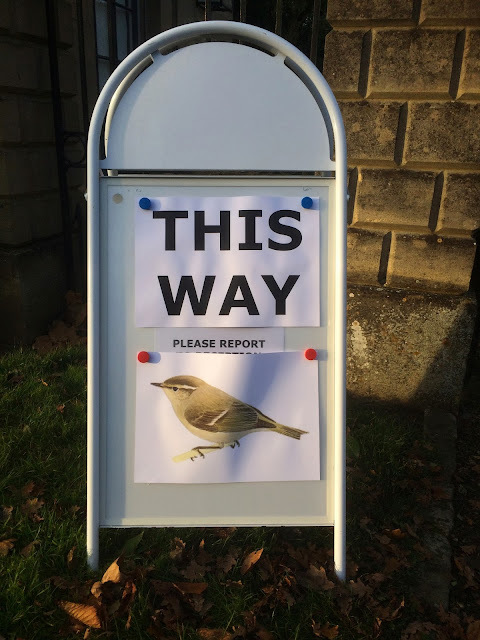 The next day I started to regret the decision though as I started to receive texts from people saying what a good looking bird it was and how well it was showing. Then seeing pictures of the bird on the internet showing that it was a cracking looking drake meant that if I got an opportunity to see it I'd have to make the effort. Due to work that opportunity didn't come until December 21st but luckily the bird was still being reported all through the previous week. Jon, Kirsty and me decided to give it a bash and we made our way there first thing in the morning. The heavy rain was dampening the mood a little but patches of blue sky started to raise spirits and as we approached the site my phone beeped with a Birdguides alert to say the bird was still there. Phew! We parked up and walked along the path towards the dam and it wasn't long before we picked it out quite a way off but luckily it started to swim closer and closer. It eventually reached the tower by the dam and it seemed to like this area for feeding as it constantly dived and also played a game of hide and seek as moved from one side of the tower to the other making photographers and birders pick up their tripods to run around to the other side only to run back again as it changed direction. As the sun periodically emerged we got to some good shots (thanks once again for Jon in allowing me to use his camera this weekend) and I also Iphonescoped a shaky video. After we had our fill of the stunning Velvet Scoter we admired the Tree Sparrows on the feeders and then we headed over to Pitsford Reservoir in Northants to try and find the Great Northern Diver. We had a bite to eat in the cafe before making our way to the Moulton Grange Bay car park and headed straight out to the Holly bush area as this is where the bird seemed to favour during the previous week. Unfortunately though it wasn't here and despite searching and searching we couldn't see it. 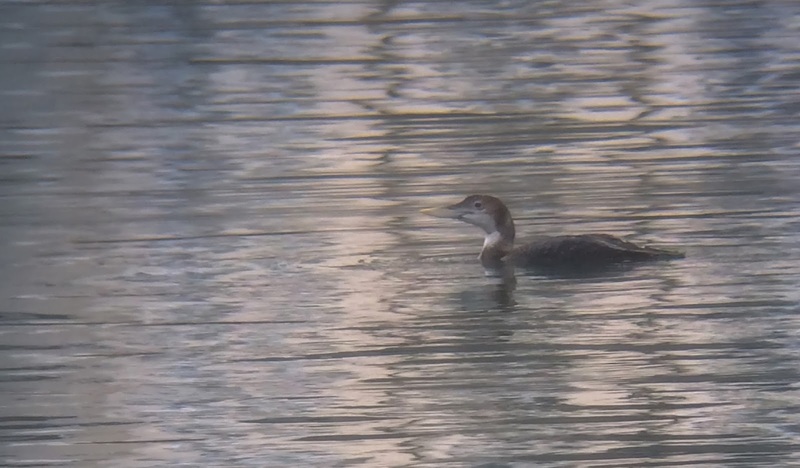 I have seen a lot of Great Northern Divers in the past though so I knew not to give up hope just yet. It's amazing how such a big bird can be so difficult to see! Mainly because they spend so much time underwater and they can sink quite low when swimming. 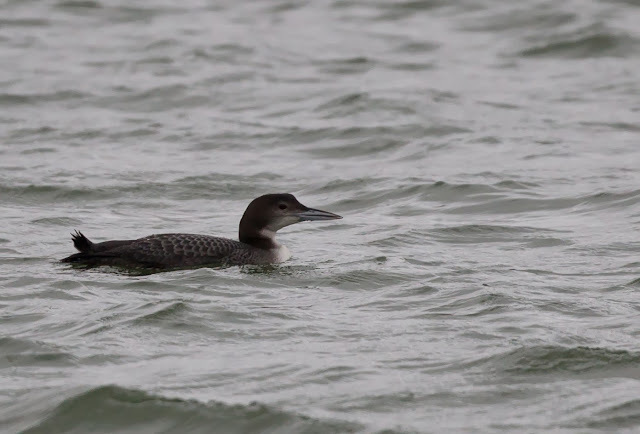 We walked back towards the car following the bank constantly checking the water infront of us and as we reached Moulton Grange Bay I saw a large bird slowly swimming and when I got the bins on it we finally had the Great Northern Diver. At last! I really though at one point we were going to dip it and we still lost it a couple of times despite knowing the area it was in but eventually it came up and slowly swam around the small headland we were standing on allowing us to get a few pics before the windsurfers came a bit too close and it swam quickly off around the corner - no doubt back to the Holly bush. Great Northern Diver, Pitsford Res, Northants. The following day me and Jon decided to head to Bucknell Wood to try and get some pics of a showy Kingfisher John Friendship-Taylor had found a while ago. Sam joined us too and John Friendship-Taylor and his partner Emily met us there by the pond but unfortunately the previous few days heavy rain had turned the water very muddy and the Kingfisher had gone. The heavens absolutely opened when we got there too so we spent quite a while standing under some trees trying to keep dry so we headed back to the car to decide what to do next. Sam and the others had to head off me Jon and me decided to try and see the Cattle Egret that had been at Steeple Claydon in Buckinghamshire. John Friendship-Taylor gave us the directions as he'd seen it earlier in the week and we headed off. Luckily Birdguides did it again with impeccable timing and an alert appeared on my phone to say the bird was there so we parked up and walked along the road to view the field. Unfortunately though the bird wasn't there! We had heard that it was mobile so we didn't give up and we wandered along the road checking the fields on either side. We reached the farm and all of a sudden I looked towards the bullocks in a field infront of Briars Hill farm to see a pure white bird glowing in the sun. 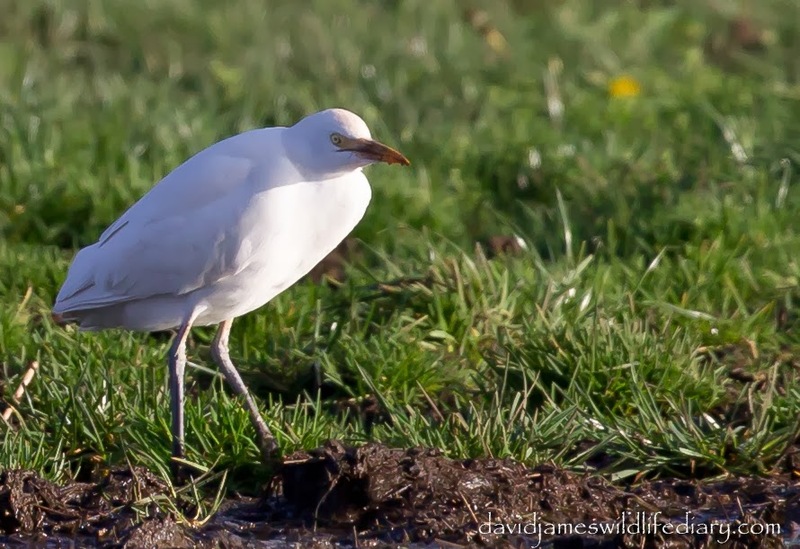 I got the bins on it to confirm it was the Cattle Egret and we gradually approached while taking pictures. The bullocks though were their normal playful selves and one in particular seemed rather fascinated by the Egret and it eventually scared it off. Lucily though the bird soon came back and we approached the area from along the footpath to the west of the farm. Luckily the bullocks then switched their attentions from the Cattle Egret to us which actually meant we had a bit of cover to get a little closer to take some more pics. We rattled off a few pics before the bird looked around and then took off, circled round, and flew over the road and into the sheep field. We left the bird at this point and headed home. It had been a great weekend some some good views of normally hard to "see well" birds. Most views of Great Northern Divers and Velvet Scoters are either bobbing up and down on choppy seas or distantly flying along the coast, and of course it was very nice to see a UK Cattle Egret actually associating with cattle! Things have felt a little slow since the last post but the eagle eyed among you may have noticed the "Cloud of Clouded Yellows" post getting longer and longer as more revelations appeared at the site. On the 24th of November the lure of the recently discovered flock of Parrot Crossbills at Holt Country Park proved too good an opportunity to miss and we headed over early in the morning. We (John Friendship-Taylor, Sam Candy and Jon and Kirsty Philpot) had a quick stop enroute to see 4 Common crane in the usual field opposite the "Chill Out" cafe at Guyhirn and then we drove straight to Holt. We met up with local birders Kieran and Rob and had a catch up in the car park while waiting for the flock to work their way around to our area. Soon enough a birder standing by the car park entrance waved his arms and we shot round to be greeted with at least 9 Parrot Crossbills feeding in a pine tree by the side of the road. After having such good views of Two Barred earlier on the year I was very keen to see these and they didn't disappoint as they showed very well feeding on the cones. Below are some John Friendship-Taylor's shots of the birds. We left here to pop round the corner to see the Glaucous Gull and then headed to the coast to hopefully catch up with a Black Brant. 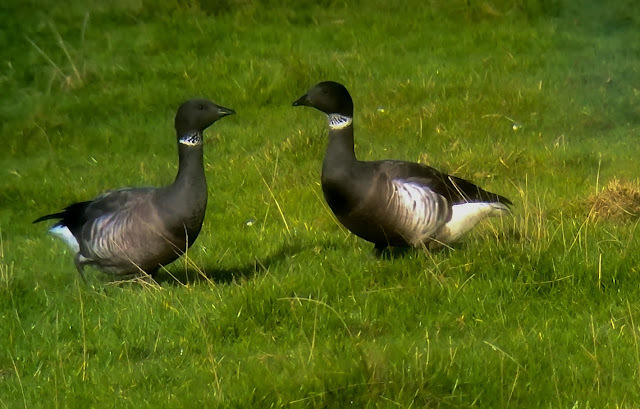 We headed up to Salthouse and walked along the beach before finding a large flock of Brent Geese in a field near to Kelling after having a quick scan we picked out a Black Brant tucked in with them. 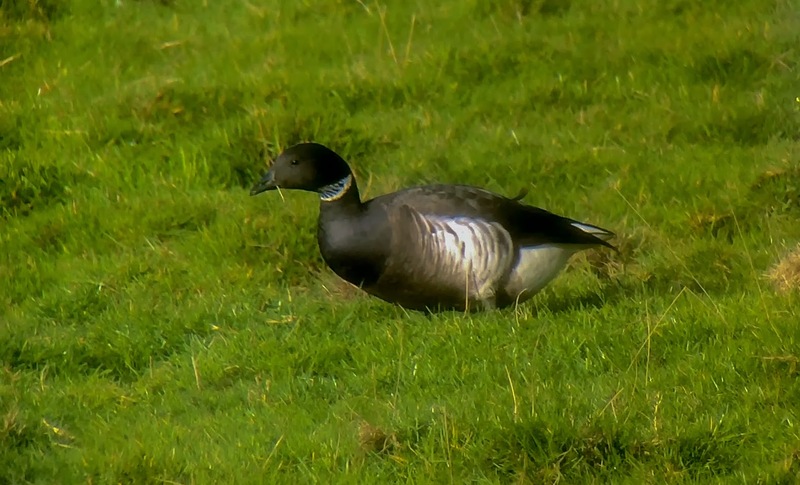 We also managed to get great views of one at Cley as it fed in a field by the road. 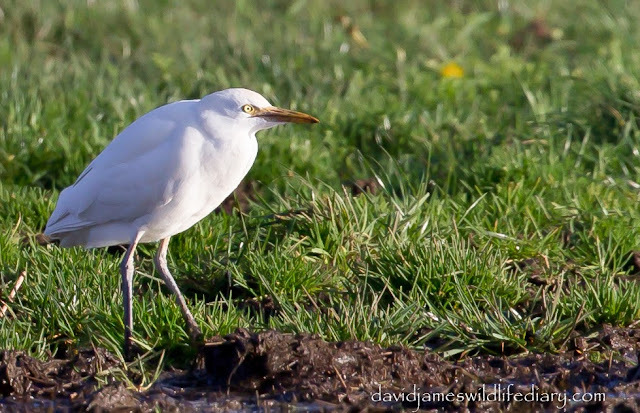 The below photos are digiscoped and really don't do the bird justice as it looked amazing in the sunshine. We gradually birded along the coast before heading home. We did the obligatory look down the Wolferton triangle and we were pleasantly surprised to see a Golden Pheasant standing in the middle of the road as soon as we pulled in. The next really productive day was on the 1st of December. 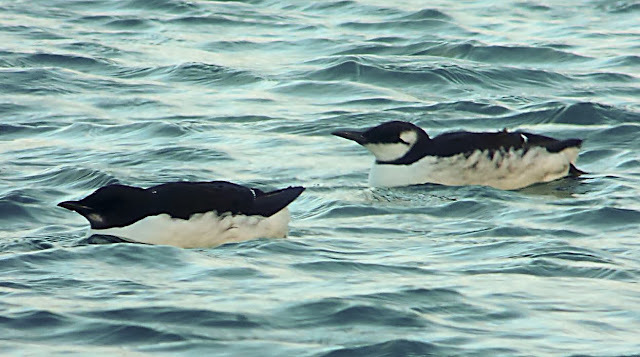 The inland counties were seemingly under a mini Long Tailed Duck invasion and Northants was no exception with birds seen at Pitsford and Thrapston Gravel Pits. In keeping with my run of luck this latter half of the year everything turned up while I was at work and as the weekend gradually approached a trip to Thrapston was on the cards. Luckily though a Long Tailed Duck was discovered at nearby Summer Leys and very soon after another two were found on the same lake. Me. John Friendship-Taylor and Jon and Kirsty Philpot went the following day and had incredible views of all three on a still morning. They put on quite a show as they preened and fed in a back water of Mary's Lake. From here we moved onto the Ditchford Gravel Pit complex to check out the Gulls. There were a lot of birds in the area and we started to go through them. As I was trying to pick out a possible Caspian John Friendship-Taylor noticed an adult Iceland Gull walking along the back of the group. A phenomenal spot by him considering the amount of birds in the area and as the birds in front gradually moved around it came more into view. This was my first adult Iceland so I was very happy being happy to see it but unfortunately though the local Red Kite population were doing regular sorties across this field and in the process they were constantly flushing the Gulls. It wasn't long before it flew and regrettably it wasn't relocated despite a thorough search. Another one of the star birds in the area though was a mobile Great White Egret. It had been seen previously in the day further east up the valley but as we left the area the Iceland Gull was in we accidentally spooked it from the Viaduct pit. We checked all the Gulls in the area before walking underneath the viaduct and onto the next gravel pit towards Wellingborough. 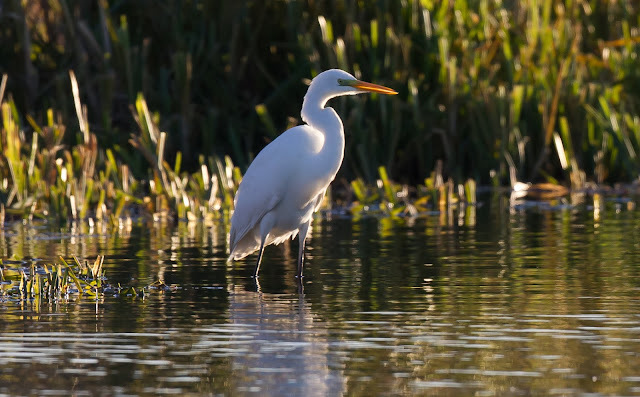 The Great White Egret was seen in a corner of the lake and I couldn't resist using Jon's borrowing Jon's lens to get some shots. I managed to get some shots of the bird in the water before it flew, and after doing a couple of laps of the far end of the lake it flew straight over my head and back towards the viaduct pit. It looked amazing in the sunshine and I am very pleased with the images I was able to achieve. On the 8th of December we had a quick trip to Grafham to see the inland Velvet Scoter. We had to do a bit of searching ,seeing another inland Long Tailed Duck, but eventually we saw it fly into the middle of the reservoir from the dam end. 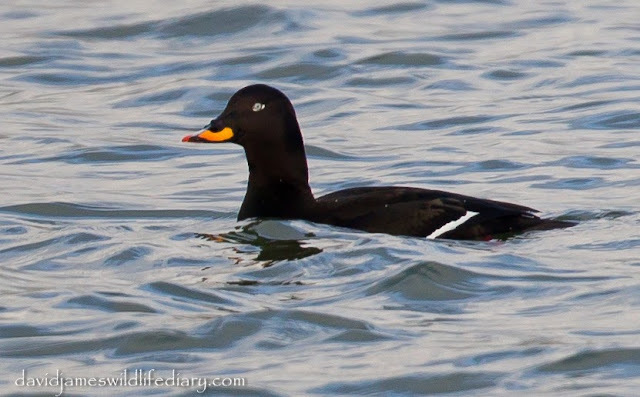 It was a real treat to get such good views of a Velvet Scoter as all my previous views had been of birds either bobbing up and down on the sea or distantly flying with lots of Common Scoters along the coast. We watched for quite a while as it washed and preened before it flew back towards the dam. We left here and had a good look round Ecton SF on the way home but apart from a couple of calling Chiffchaff we saw little of note. 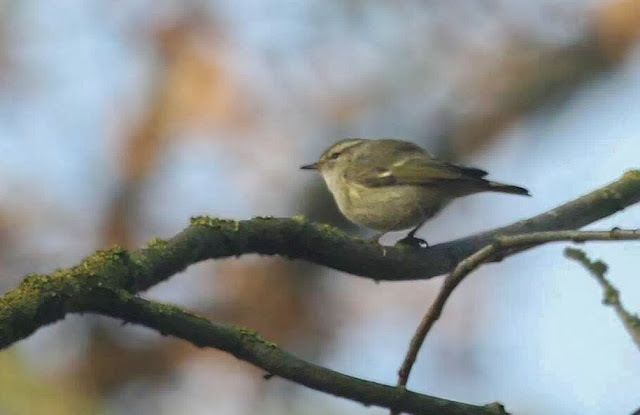 The best bird of recent weeks (and perhaps the bird of the year for me) though has to go to the recently found Hume's Leaf Warbler found by local birder Neil McMahon. It was found at the weekend at a site to the north of the county and as the site is strictly private access had to be arranged for people to come and see it. Neil and Eleanor did an incredible job organising the day and a huge pat on the back to them both for negotiating with the landowners so people could come and see it. It's not very often you get signposts telling you where the bird is. Me, John Friendship-Taylor and Sam Candy arrived at the site at 12.45 and within minutes of parking the car we were viewing the bird. The sun had fortunately started to shine shortly before we got there and the bird was taking full advantage of the weather to feed along the row of trees. It quite often liked to come out into some of the tall bare trees giving incredible scope views as it busily fed and called away. In fact the bird was so vocal when we were there that keeping up with it wasn't a problem a lot of the time. Unfortunately as the bird was so flitting digiscoping some pics was impossible but I will have the memories for a very long time and I have a feeling it will be one of those talked about birds for years to come. Luckily though there were plenty of photographers on site and one of them was Sam Viles who has very kindly sent me a shot of the bird which is below. 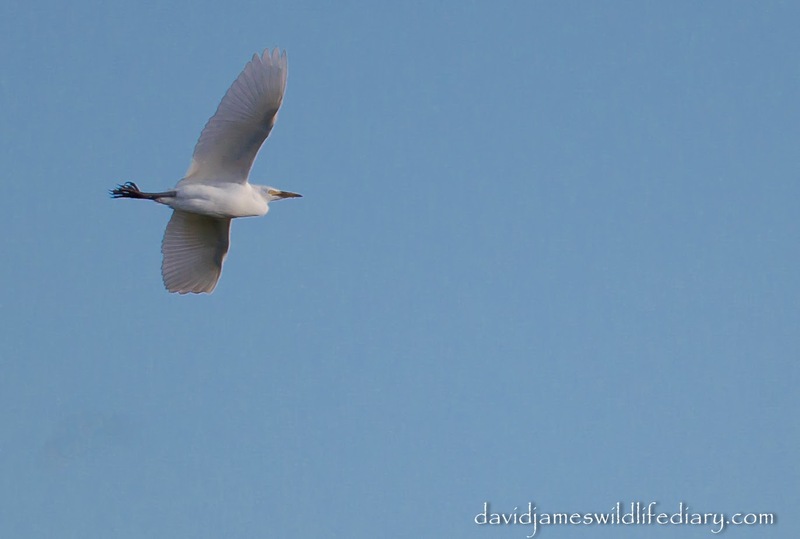 As a nice touch we drove home via the Pitsford reservoir causeway and easily saw one of the Great White Egrets from the car standing at the mouth of Holcot Bay. It's been a great end to a fantastic year! I did start county yearlisting from the beginning but as more and more birds appeared that I couldn't get to due to work I pretty much gave up. Bizarrely I went for everything I could last year and only got to 169. This year I have taken things in my stride and missed a few birds along the way but still got to 168! With two of those birds being the Woodchat Shrike and the Hume's Leaf Warbler which will very probably not be easy to see in the near future again. I am toying with the idea of keeping it local again next year, in fact during January I have decided to keep it very local and I have signed myself up to the "footit" challenge (by the time I heard about it this year it was too late) so it will be interesting to see the results. As there isn't much variable habitat a mile from my front door I have set myself the challenge of seeing 50 bird species which I am hoping shouldn't be too hard to reach. But then as this year has been full of surprises perhaps I should write the county yearlist off just yet.